Pimlico Race Course opened in 1870, and has been hosting races ever since. Based in Baltimore, Maryland, the race track is the home of the Preakness Stakes. In the racing world, this is the jewel of the Triple Crown for American horse racing. Held every may on the third Saturday of the month, the race is a big feature on the circuit after the Kentucky Derby. Over 100 000 people gather at the track to watch the Kentucky Derby champion race for the second leg of the crown every year. 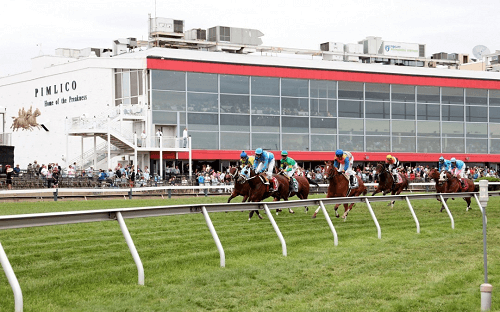 This means that the Pimlico Race Course handles nearly $180 million in bets on the day. While there is no exact number for online bets yet, experts estimate a higher number than physical bets. So, to start betting on races at Pimlico, you’ll need a trusted bookie. We recommend the site below for a secure gambling experience. If the Pimlico Race Course sounds familiar, it’s because the track is the home of the famed showdown between Seabiscuit and War Admiral. The race, held in 1938, was famously recreated at the track for the film of the same name. Aside from Preakness, Pimlico Race Track also hosts the Grade one Black-Eyed Susan event before the big race. This event is for the three-year-old filly division. What’s more, the track also hosts the Grade Two Dixie Stakes and Pimlico Special. Both events are held on the main track for older horses. What makes the track special is the layout, because Pimlico has tight turns and favors early speed. As such, this is featured heavily in selections, as well as bets and odds on winners. The signature event at the track is the mile and one-sixteenth run. Generally, this event is usually considered too difficult for most sprinters and milers. However, Pimlico is still considered an easier handicap because the fields are smaller. Still, most top Derby competitors tend to skip the race and wait for Belmont Stakes. Americans who want to bet on the Preakness Stakes and other events at Pimlico Race Track can do so both in person and online. All you need to do is research the favorites to win, place your bet, and wait for the result. A word of caution, though, don’t always rely on a Kentucky Derby winner. This is because Pimlico is notorious for breaking winning streaks. Specifically, the undefeated Barbaro lost at the track in 2006. Then again, filly Rachel Alexandra won at the track for the first time since 1915 back in 2009. So, the odds aren’t always dependable. Either way, you can still win if you bet carefully and do your homework.